Find the right solutions to your health and medical needs with services from West Coast Medicine and Cardiology based in Fremont, CA. We specialize in providing you with a unique approach to helping you reach your specific health goals. Our team of experts help you recognize the problems and take action to decrease or eliminate potential impacts to your health. Each person is different and our customized approach, tailored to individual needs, allows us to create achievable goals that are based on your lifestyle and physicality. At West Coast Medicine and Cardiology, we use state-of-the-art tools to identify your issues easily and effectively. Our health specialists are committed to help you make the changes in your life and health care. Contact us in Fremont and Hayward, CA locations today for more information about how we are dedicated to making you healthier. The visit was good, this is the first time I was seeing him and the staff also is well trained and well behaved. The doctor is also knowledgeable. Avoid! This place will make several unnecessary follow up appointments to collect more fees. The wait times are outrageous. Great experience. Very nice and attentive doctor. Would highly recommend. The appointments here are fake. You have to wait over 3 hours. They don't accept the ZocDoc form, you have to refill the form on paper. First, Dr. Suri was the only cardiologist I could schedule an appointment with on such short notice, which is very nice. I was looked at relatively quickly, and apparently I may have an issue with my heart. Something the ER doctorlaughed at previously. The only reason I went to the ER was because its very rare to get quick appointments AND testing, and I have gotten both from dr. Suri. I am very thankful Dr. Suri did not do what most other doctors have done, and that is look at my age and weight and assume my issue isn't a heart one. 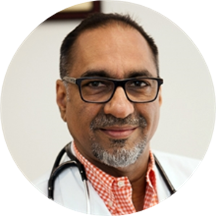 I would recommend Dr. Suri based on this one appointment. While I wasn't able to see Dr Suri, as it was my first visit and he had to leave the office, I felt very comfortable with the staff I did meet, who were all very great. I got my next fewvisits scheduled and look forward to meeting the doctor on my next appointment. Overall a great first visit at Dr Suri's office. I waited for 2 and a half hours past my appointment time and doctor visited me for less than 5 mins. Great! Helpful and patient while still being as forward and direct as he needed to be. He was listened my problem and recommend what I need to do. To me he is a good doctor. He was a really good doctor! Not just the type of doctor to give you medicine and send you home and it's not even medication you need. I would highly recommend this doctor!